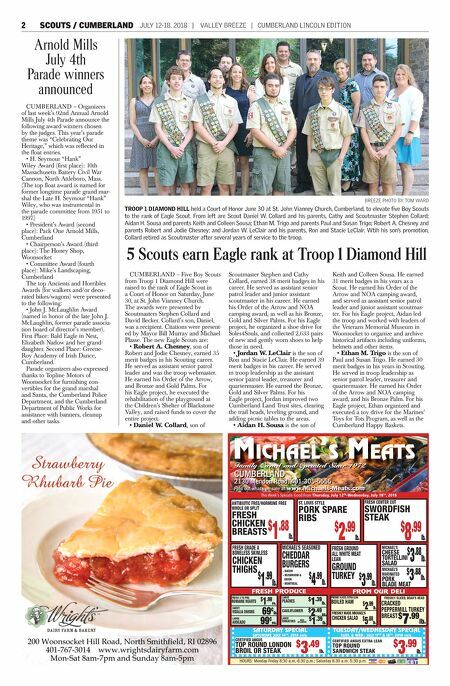 2 SCOUTS / CUMBERLAND JULY 12-18, 2018 | VALLEY BREEZE | CUMBERLAND LINCOLN EDITION BREEZE PHOTO BY TOM WARD TROOP 1 DIAMOND HILL held a Court of Honor June 30 at St. John Vianney Church, Cumberland, to elevate five Boy Scouts to the rank of Eagle Scout. From left are Scout Daniel W. Collard and his parents, Cathy and Scoutmaster Stephen Collard; Aidan H. Sousa and parents Keith and Colleen Sousa; Ethan M. Trigo and parents Paul and Susan Trigo; Robert A. Chesney and parents Robert and Jodie Chesney; and Jordan W. LeClair and his parents, Ron and Stacie LeClair. Wtih his son's promotion, Collard retired as Scoutmaster after several years of service to the troop. 5 Scouts earn Eagle rank at Troop 1 Diamond Hill CUMBERLAND – Five Boy Scouts from Troop 1 Diamond Hill were raised to the rank of Eagle Scout in a Court of Honor on Saturday, June 30, at St. John Vianney Church. The awards were presented by Scoutmasters Stephen Collard and David Becker. Collard's son, Daniel, was a recipient. Citations were present- ed by Mayor Bill Murray and Michael Plasse. The new Eagle Scouts are: • Robert A. Chesney, son of Robert and Jodie Chesney, earned 35 merit badges in his Scouting career. He served as assistant senior patrol leader and was the troop webmaster. He earned his Order of the Arrow, and Bronze and Gold Palms. 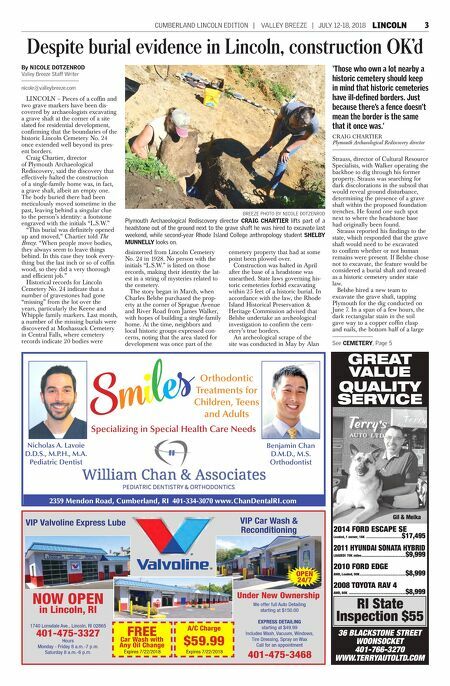 For his Eagle project, he executed the rehabilitation of the playground at the Children's Shelter of Blackstone Valley, and raised funds to cover the entire project. • Daniel W. Collard, son of Scoutmaster Stephen and Cathy Collard, earned 38 merit badges in his career. He served as assistant senior patrol leader and junior assistant scoutmaster in his career. He earned his Order of the Arrow and NOA camping award, as well as his Bronze, Gold and Silver Palms. For his Eagle project, he organized a shoe drive for Soles4Souls, and collected 2,633 pairs of new and gently worn shoes to help those in need. • Jordan W. LeClair is the son of Ron and Stacie LeClair. He earned 39 merit badges in his career. He served in troop leadership as the assistant senior patrol leader, treasurer and quartermaster. He earned the Bronze, Gold and Silver Palms. For his Eagle project, Jordan improved two Cumberland Land Trust sites, clearing the trail heads, leveling ground, and adding picnic tables to the areas. • Aidan H. Sousa is the son of Keith and Colleen Sousa. He earned 31 merit badges in his years as a Scout. He earned his Order of the Arrow and NOA camping award, and served as assistant senior patrol leader and junior assistant scoutmas- ter. For his Eagle project, Aidan led the troop and worked with leaders of the Veterans Memorial Museum in Woonsocket to organize and archive historical artifacts including uniforms, helmets and other items. • Ethan M. Trigo is the son of Paul and Susan Trigo. He earned 30 merit badges in his years in Scouting. He served in troop leadership as senior patrol leader, treasurer and quartermaster. He earned his Order of the Arrow and NOA camping award, and his Bronze Palm. For his Eagle project, Ethan organized and executed a toy drive for the Marines' Toys for Tots Program, as well as the Cumberland Happy Baskets. Arnold Mills July 4th Parade winners announced CUMBERLAND – Organizers of last week's 92nd Annual Arnold Mills July 4th Parade announce the following award winners chosen by the judges. This year's parade theme was "Celebrating Our Heritage," which was reflected in the float entries. • H. Seymour "Hank" Wiley Award (first place): 10th Massachusetts Battery Civil War Cannon, North Attleboro, Mass. (The top float award is named for former longtime parade grand mar- shal the Late H. Seymour "Hank" Wiley, who was instrumental in the parade committee from 1951 to 1997.) • President's Award (second place): Pack One Arnold Mills, Cumberland • Chairperson's Award (third place): The Honey Shop, Woonsocket • Committee Award (fourth place): Mike's Landscaping, Cumberland The top Ancients and Horribles Awards (for walkers and/or deco- rated bikes/wagons) were presented to the following: • John J. McLaughlin Award (named in honor of the late John J. McLaughlin, former parade associa- tion board of director's member). First Place: Bald Eagle in Nest, Elizabeth Nadow and her grand- daughter. Second Place: Greene- Roy Academy of Irish Dance, Cumberland. Parade organizers also expressed thanks to Topline Motors of Woonsocket for furnishing con- vertibles for the grand marshal and Santa, the Cumberland Police Department, and the Cumberland Department of Public Works for assistance with banners, cleanup and other tasks. Michael's Meats Family Owned and Operated Since 1972 This Week's Specials Good From Thursday, July 12 TH -Wednesday, July 18 TH , 2018 Find out what's on sale at www.Michaels-Meats.com CUMBERLAND 2130 Mendon Road, 401-305-5555 FResh PRODUce FROM OUR Deli HOURS: Monday-Friday 8:30 a.m.-6:30 p.m.; Saturday 8:30 a.m.-5:30 p.m. LARGE PEACHES CAULIFLOWER FRESH 3 TO PKG ROMAINE HEARTS SWEET VIDALIA ONIONS LARGE AVOCADO FRESHLY MADE MICHAEL'S CHICKEN SALAD $ 2 .99 lb. $ 7 .99 lb. FRESHLY SLICED, BOAR'S HEAD CRACKED PEPPERMILL TURKEY BREAST SATURDAY SPECIAL SATURDAY, JULY 14 TH , 2018 only. CERTIFIED ANGUS TOP ROUND LONDON BROIL OR STEAK TUESDAY/WEDNESDAY SPECIAL TUES. & WED., JULY 17 TH & 18 TH , 2018 only. CERTIFIED ANGUS EXTRA LEAN TOP ROUND SANDWICH STEAK $ 3 .99 lb. ANTIBIOTIC FREE/HORMONE FREE WHOLE OR SPLIT FRESH CHICKEN BREASTS ST. LOUIS STYLE PORK SPARE RIBS $ 2 .99 lb. $ 8 .99 lb. $ 3 .49 lb. $ 1 .99 lb. FRESH GRADE A BONELESS SKINLESS CHICKEN THIGHS MID ATLANTIC FRESH CENTER CUT SWORDFISH STEAK FRESHLY SLICED, EXTRA LEAN BOILED HAM $ 5 .88 lb. $ 4 .99 lb. MICHAEL'S SEASONED CHEDDAR BURGERS $ 3 .88 lb. MICHAEL'S CHEESE TORTELLINI SALAD LARGE TOMATOES $ 1 .39 lb. $ 3 .99 lb. FRESH GROUND ALL WHITE MEAT LEAN GROUND TURKEY $ 1 .99 ea. $ 1 .88 lb. - BACON - MUSHROOM & ONION - MONTREAL $ 3 .88 lb. MICHAEL'S MARINATED PORK BLADE MEAT 69 ¢ lb. 99 ¢ ea. $ 2 .49 ea. $ 1 .39 lb.